Video: May 5, 2012, I used my jumper cables for the fist time on this USA road trip. Yesterday, I purchased Jumper Cables, and I am lucky I did. Today, May 5th, 2012, I used them for the first time. I am in Fort Wayne, Indiana, and soon I will make a trip to Indianapolis. On hindsight after I made this video, I realized I used a 12 Volt One-Cup coffee cooker to heat water for instant coffee. That with my charging my computer, cell phone and running the Tom Tom GPS, and sitting listening to the radio in Franke Park, the battery was dead. 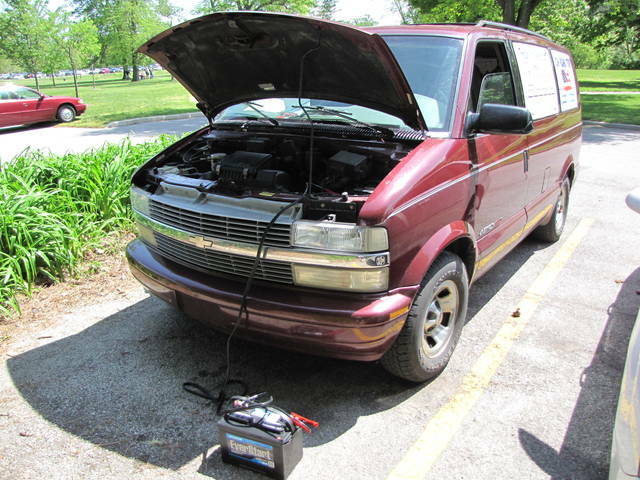 I was lucky, I had a deep cycle battery behind the seat, and was able to jump the van myself.